And then it was Autumn…. Finally, after nearly two months of nothing but heat, wildfires and smoke, the rain has arrived, and with it, much much cooler temps. We’ve already even seen snow in the higher elevations and as I stood on the crest of the Selkirk range two evenings ago, there was frost on the ground nearby. My beloved Idaho Panhandle National Forest is slated to re-open tomorrow! Idaho, North, Bonner County. 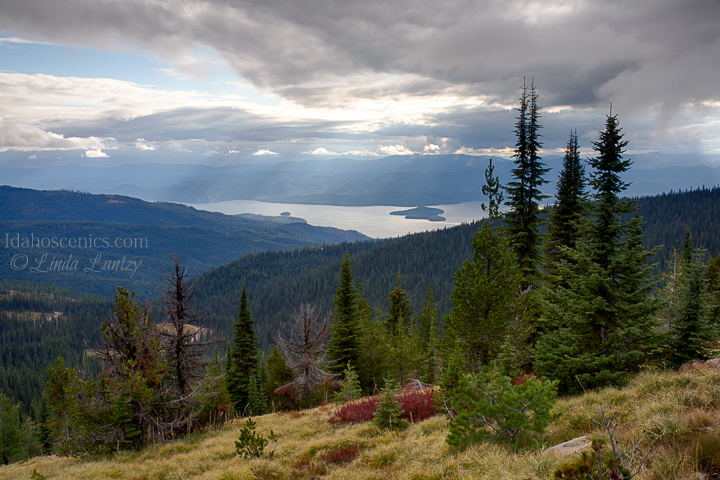 Priest Lake as viewed from the crest of the Selkirk Range looking west on a late summer afternoon. My explorations in the Selkirks Sunday was in anticipation of the upcoming “Priest Lake and the Selkirk Mountains” autumn photography workshop being hosted by Priest Lake State Park and sponsored by Friends of Idaho State Parks. I’m looking forward to leading a small group of aspiring and intermediate photographers to some great locations and teaching some classes too. Check it out, but don’t delay too long. Registrations end at 12 students or Sept. 29th, whichever comes first. Idaho, North, Bonner County. 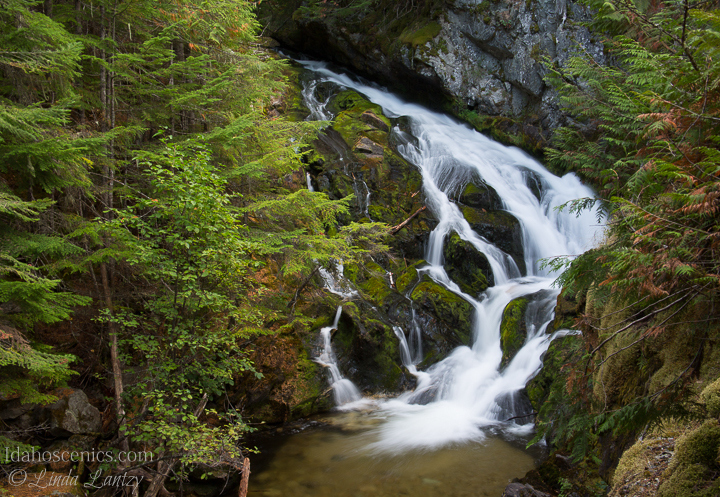 Hunt Creek Falls in the Priest Lake State Forest in late summer. It certainly feels like autumn has arrived. I’m excited, albeit a little concerned. Before I can go too far in search of fall color I have an art show to do. I’m hoping those colors don’t peak too soon! 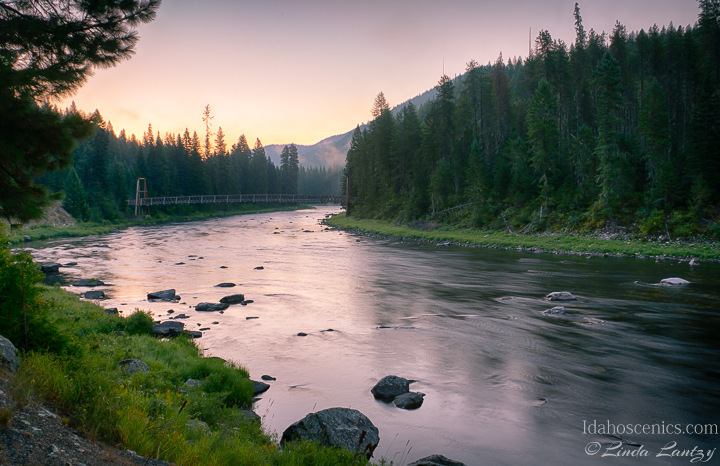 Come say hi and see an all new, gorgeous selection of Idaho Scenic Images presented on metal this weekend, Sept. 11th-13th at “Art in the Park” in Julia Davis Park, Boise. I’ll be there all three days. Friday and Saturday 10am-8pm and Sunday 10am-5pm. This is my second Boise show this year as I also had a fun one day show at the Outdoor Recreation Festival as the Idaho State Parks “Artist in Residence”. Calendar sales are in full swing this time of year and most all of my retailers have been stocked and some re-stocked 4 times! 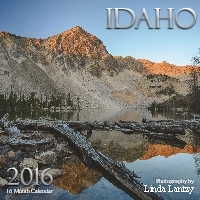 I have 3 calendars available, the 12×12 Idaho wall calendar, the mini 6×6 Idaho wall calendar and the Coeur d’Alene calendar. All are beautiful and unique and can be ordered through my website if you don’t have a retailer near you.